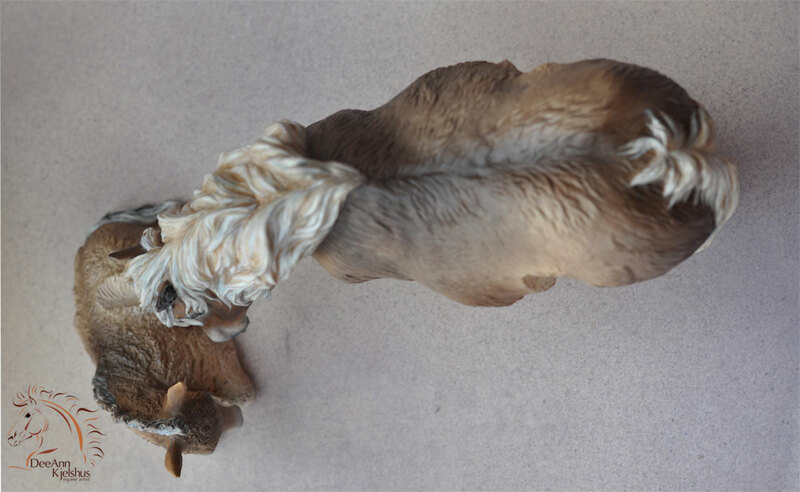 Currently available as a limited edition in Fine Artists Resin. 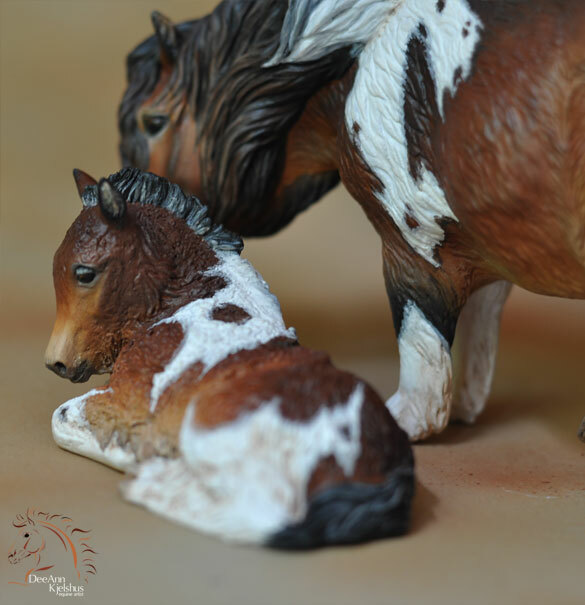 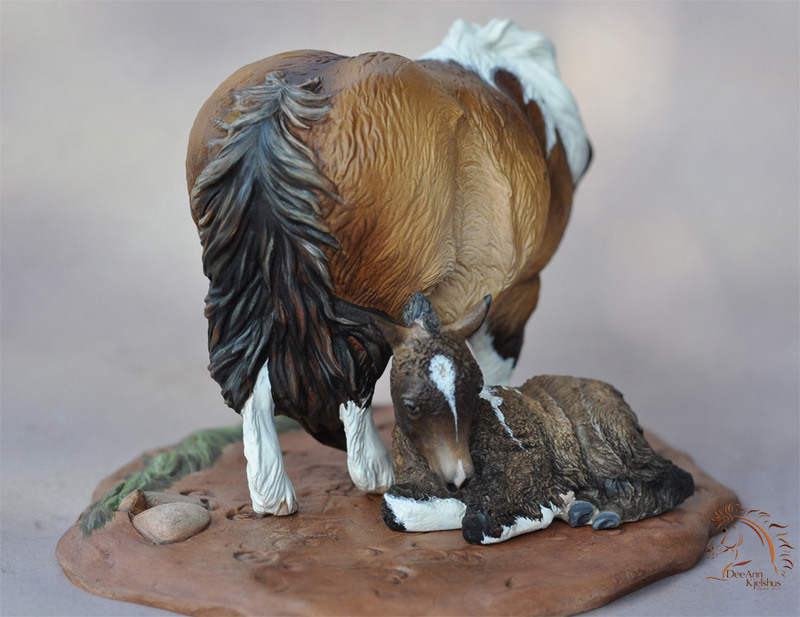 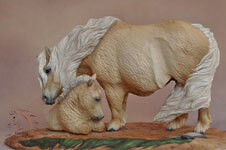 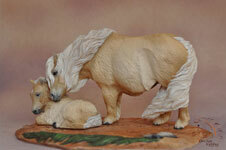 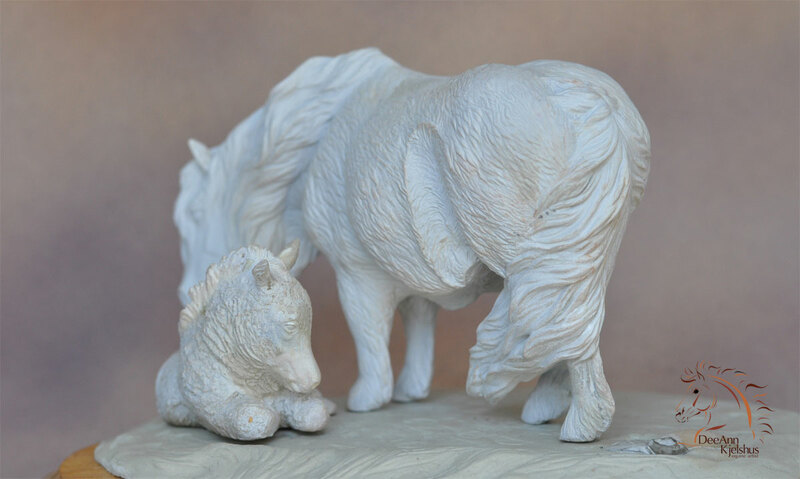 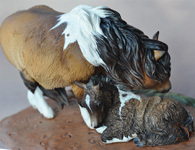 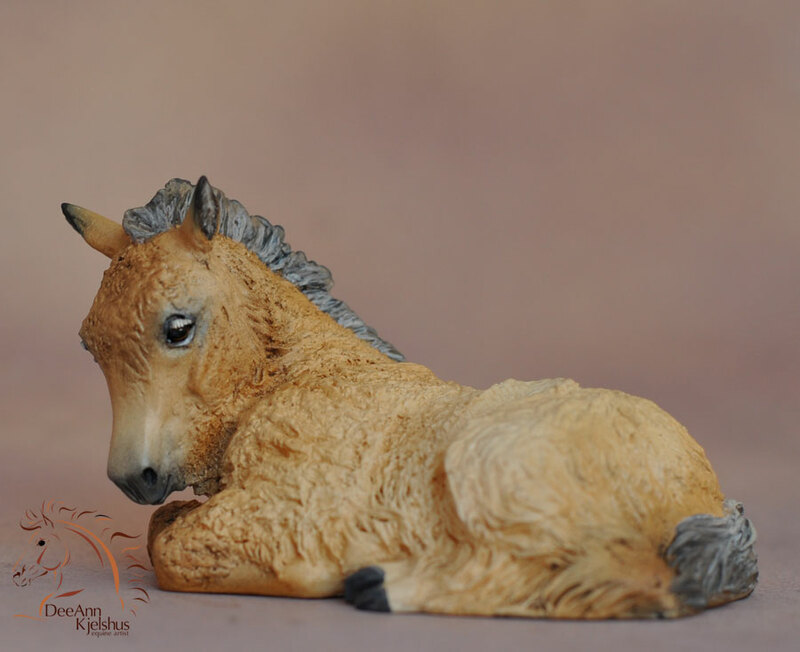 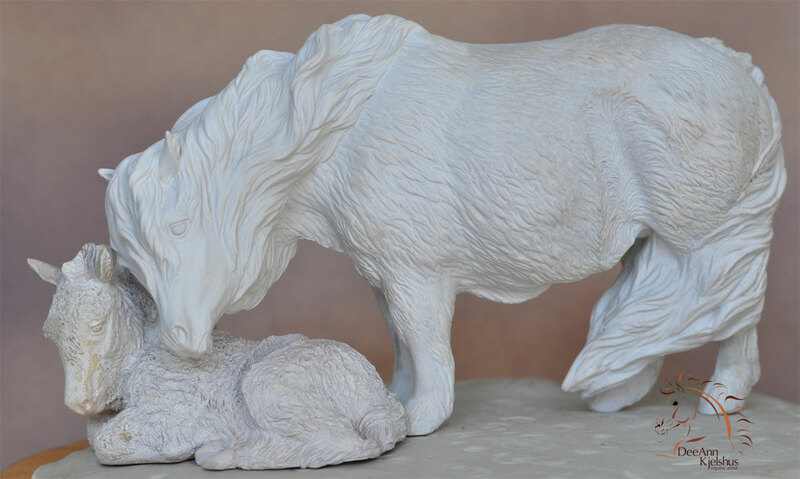 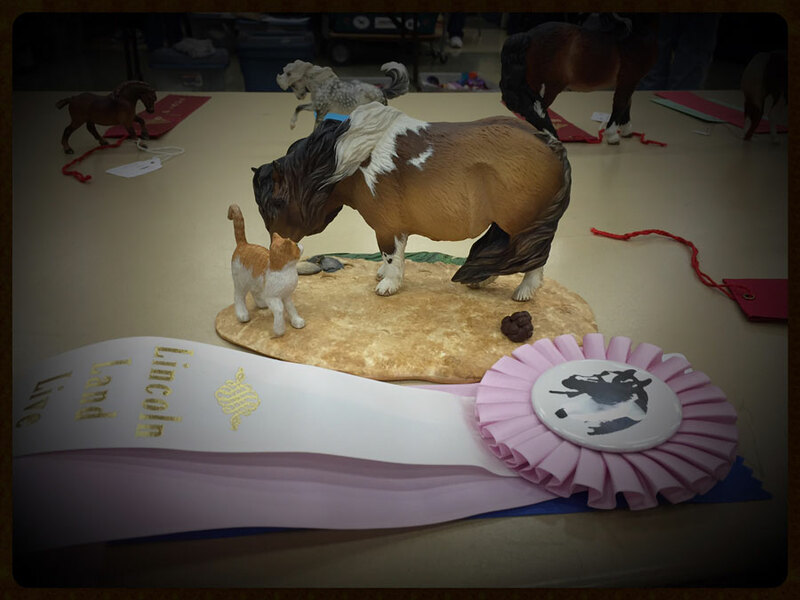 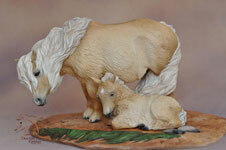 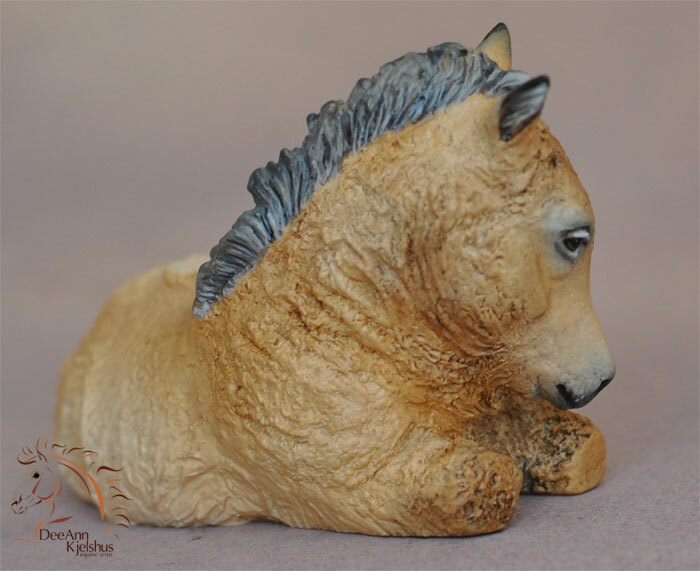 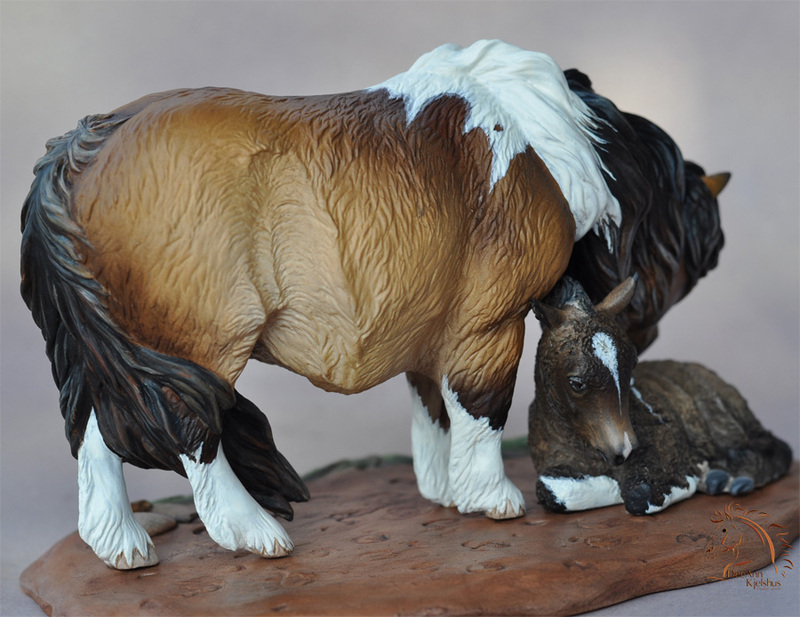 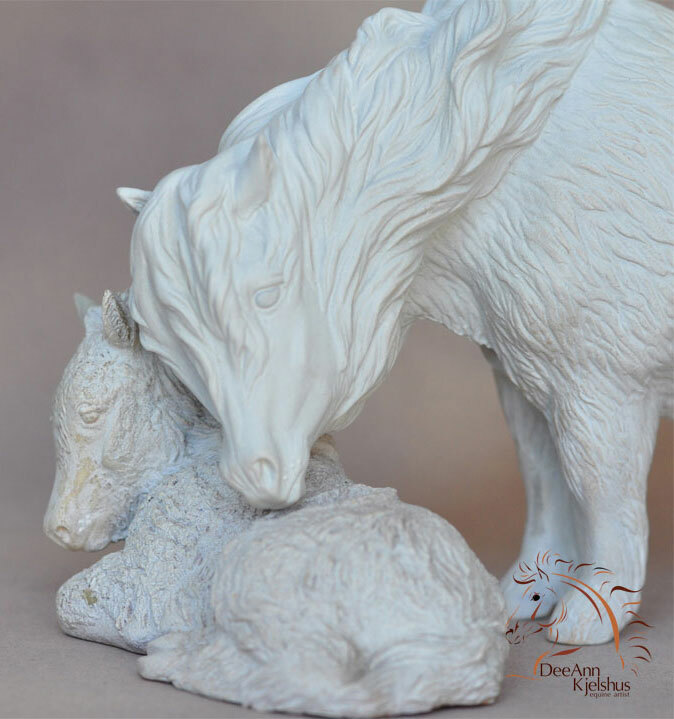 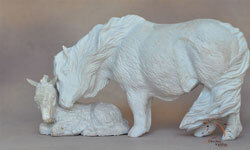 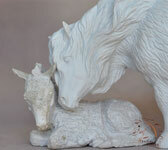 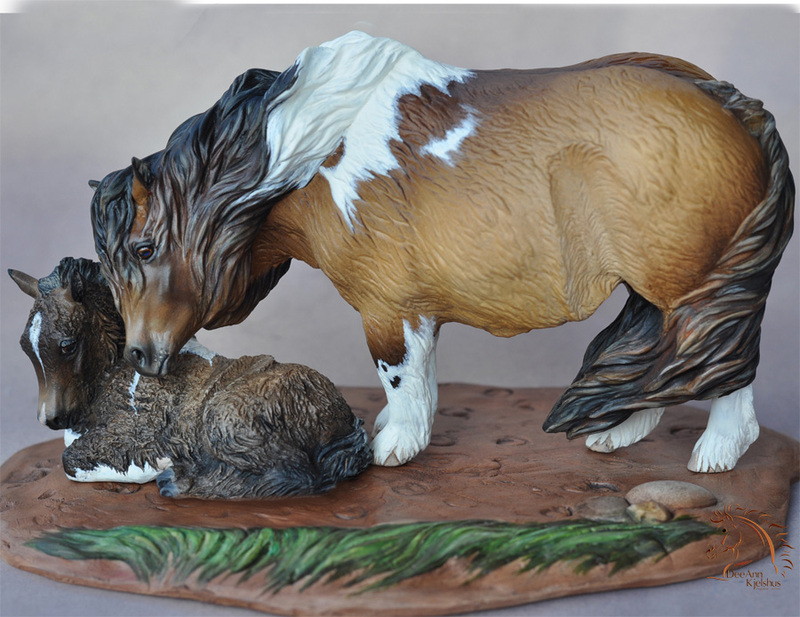 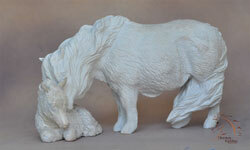 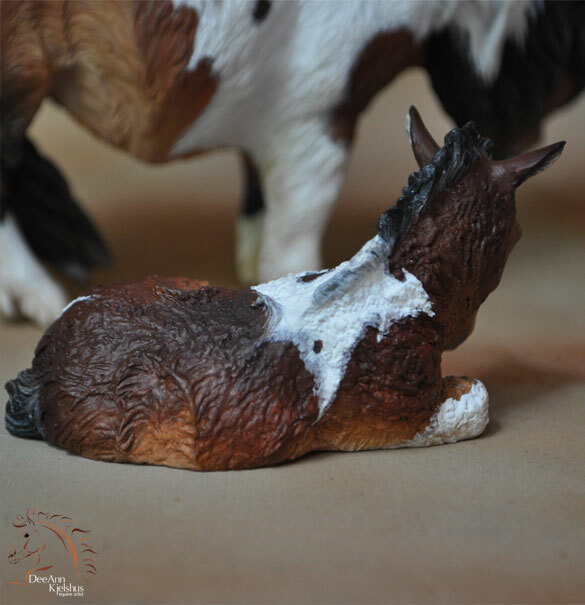 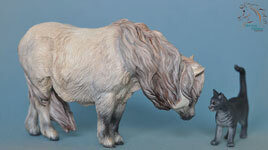 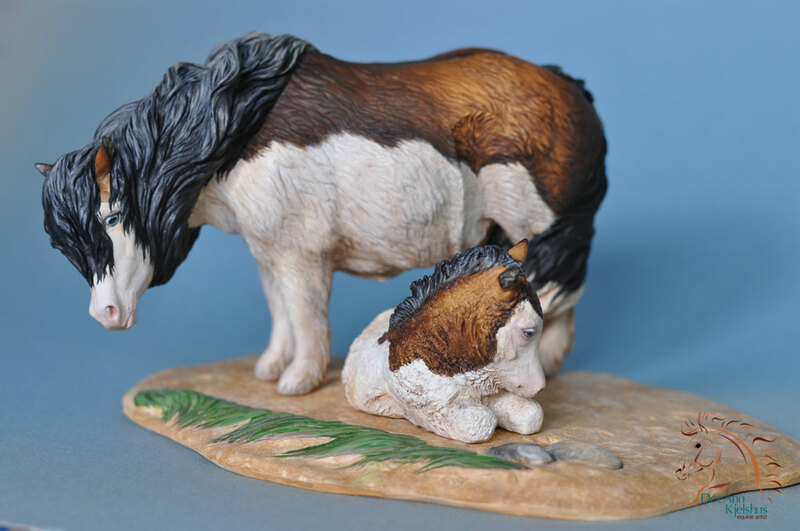 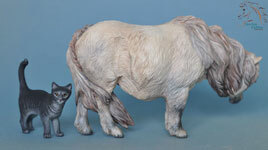 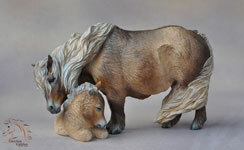 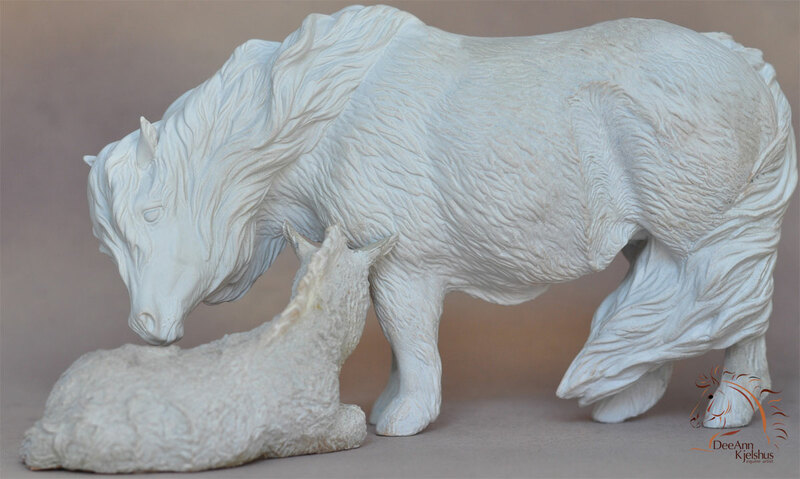 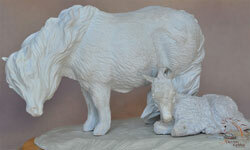 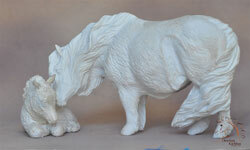 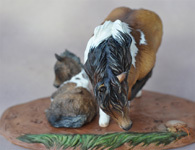 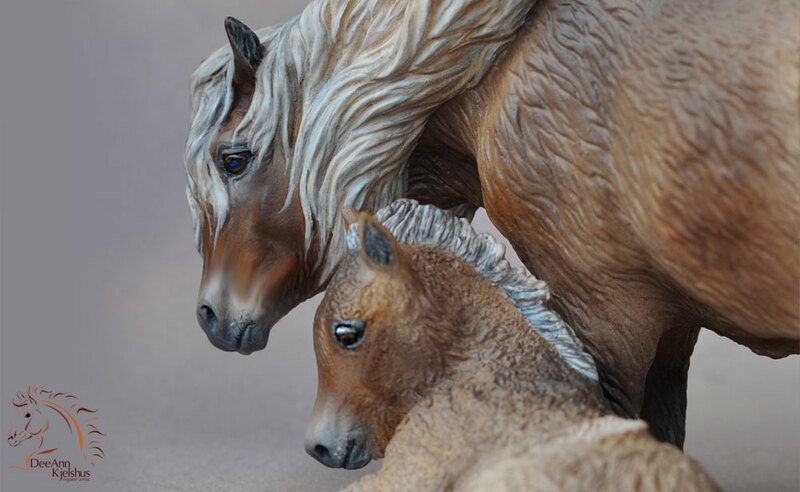 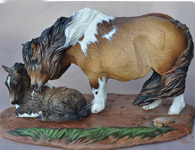 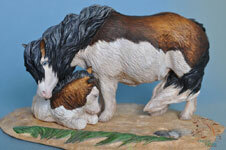 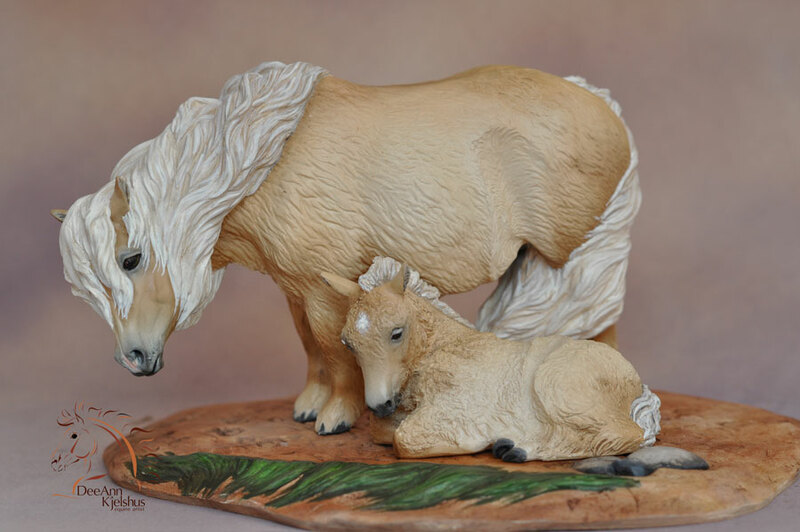 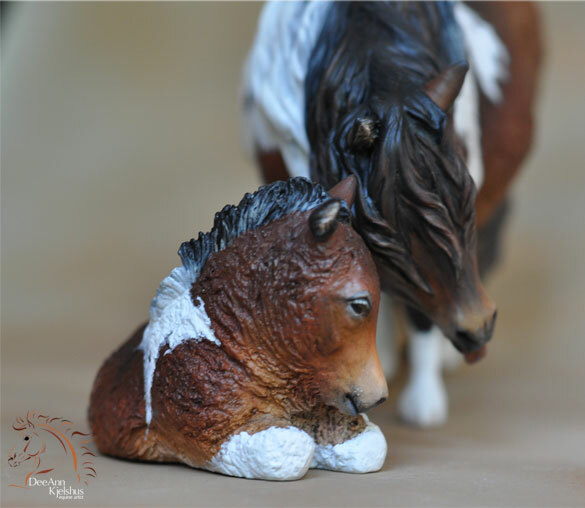 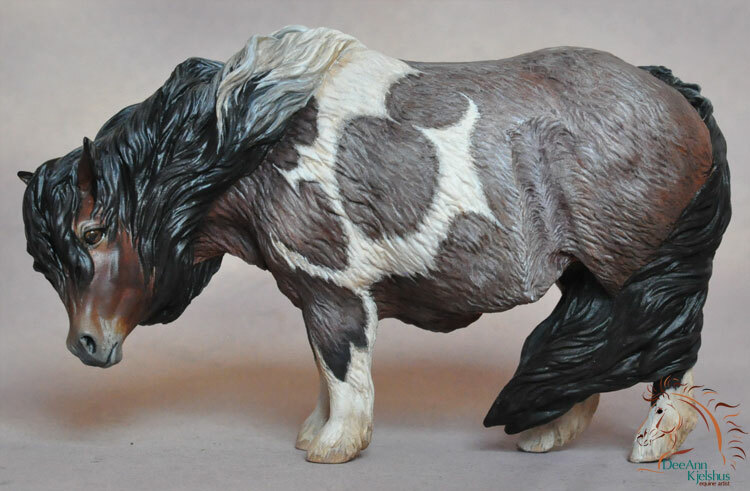 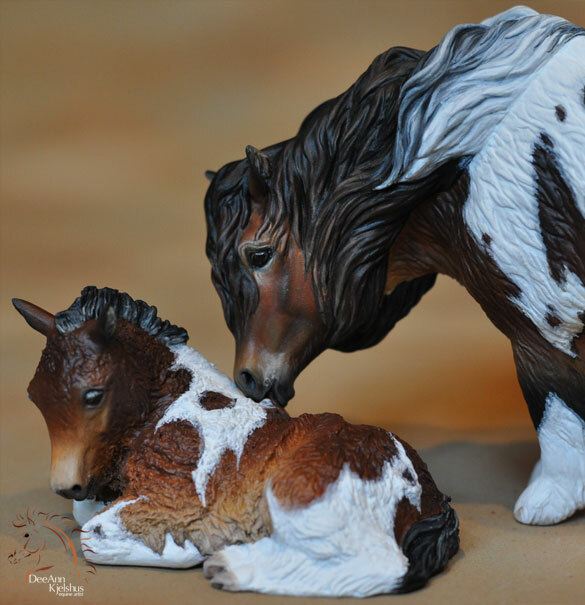 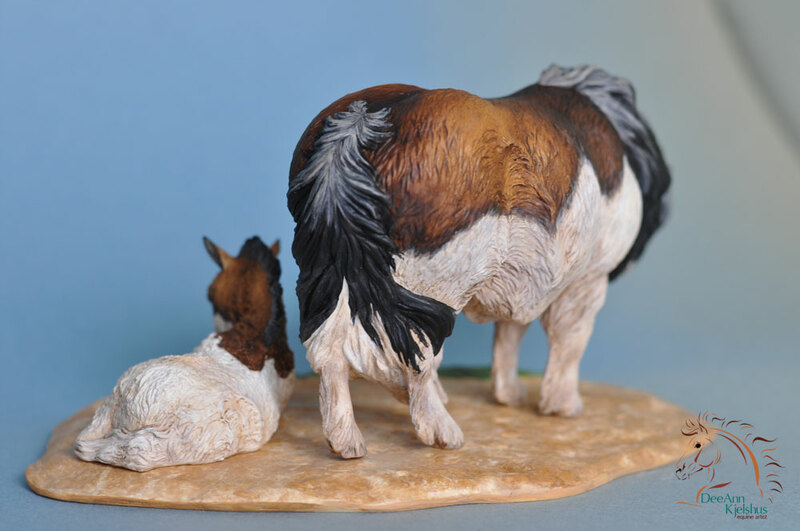 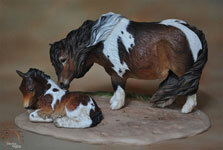 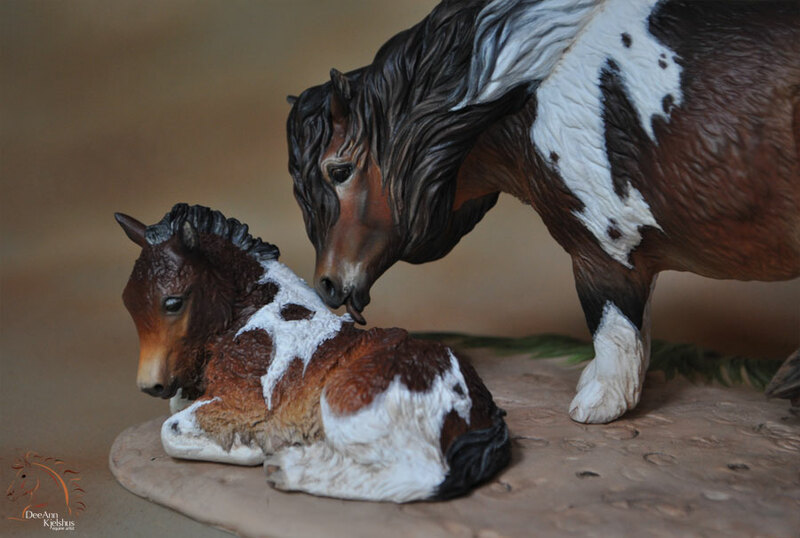 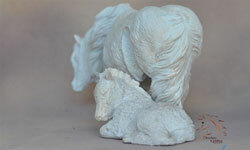 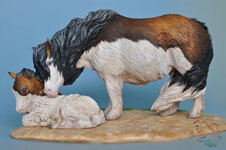 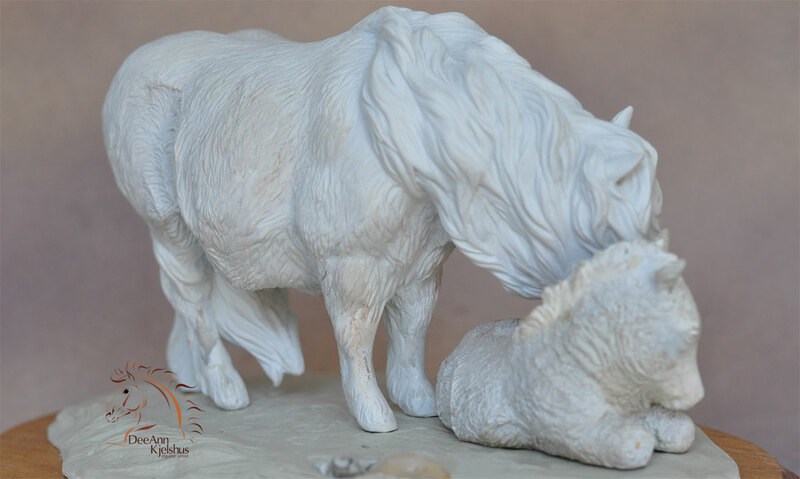 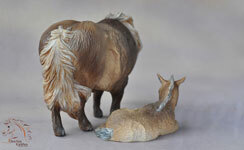 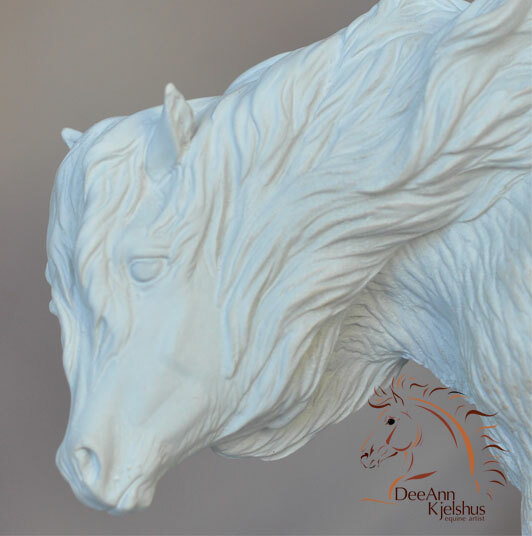 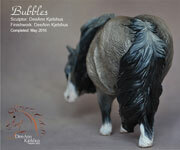 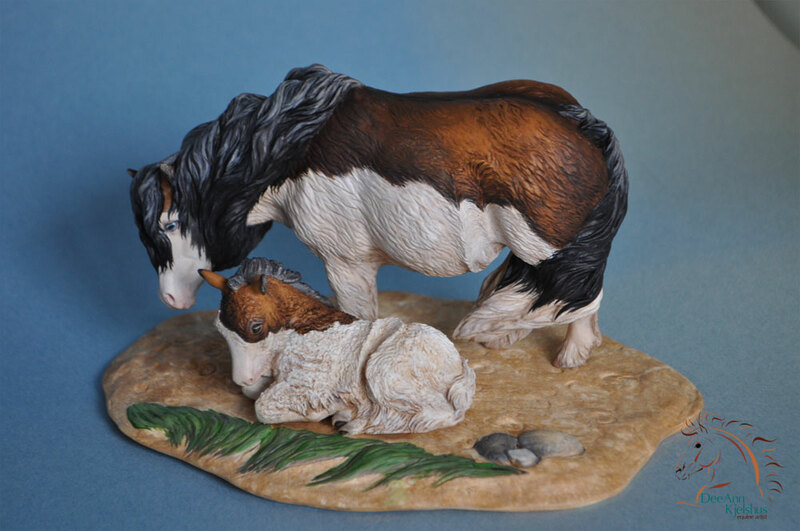 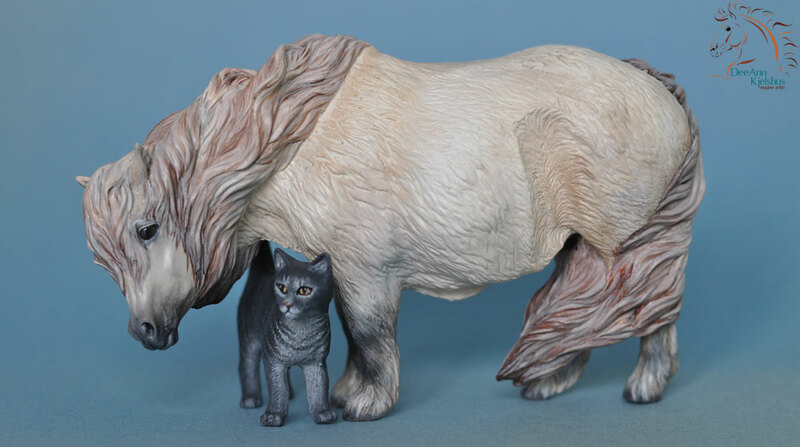 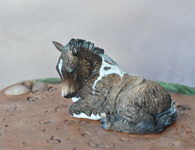 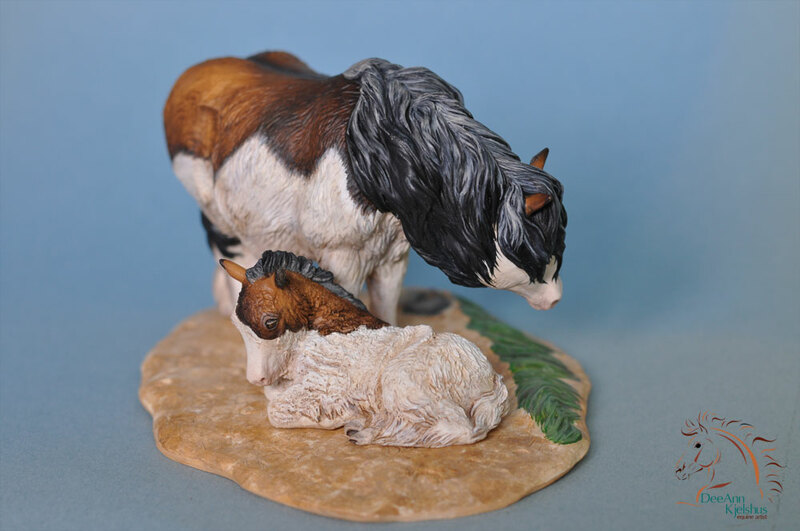 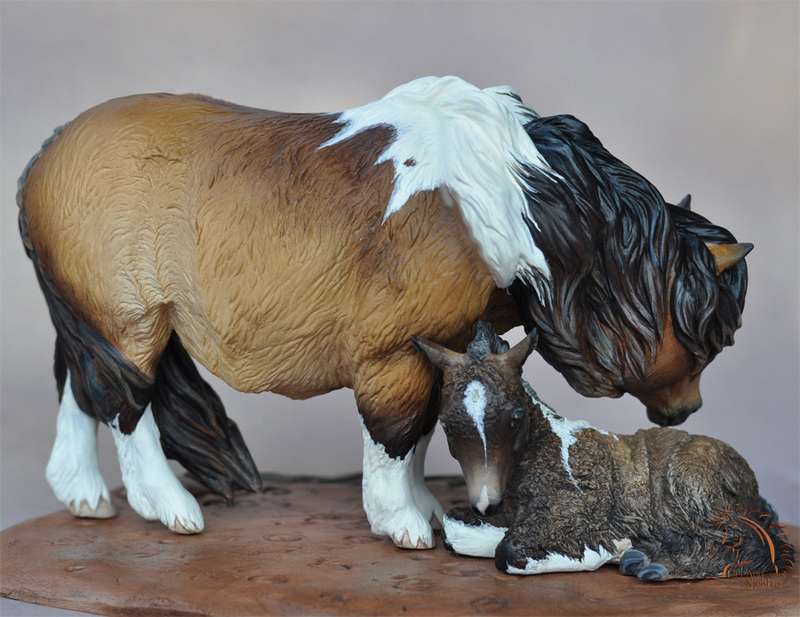 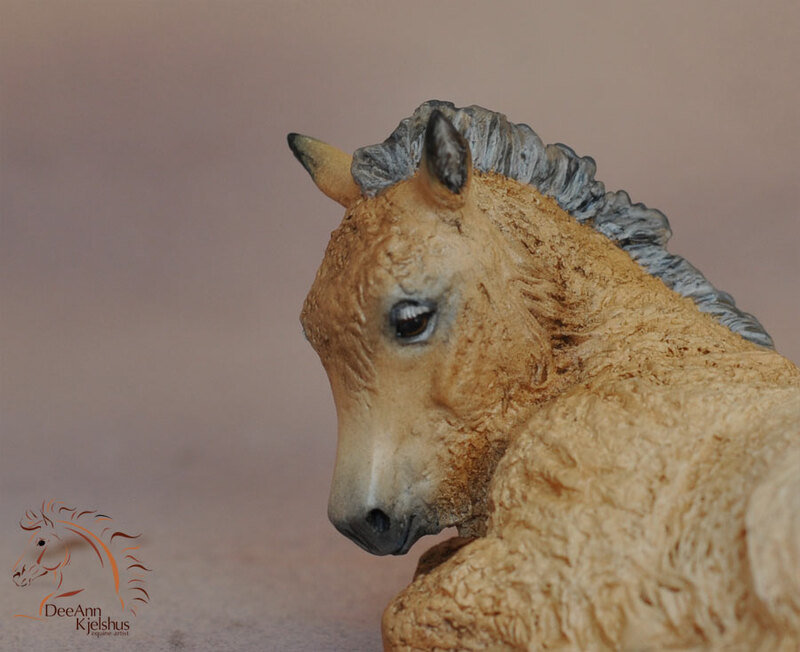 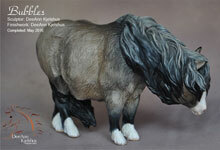 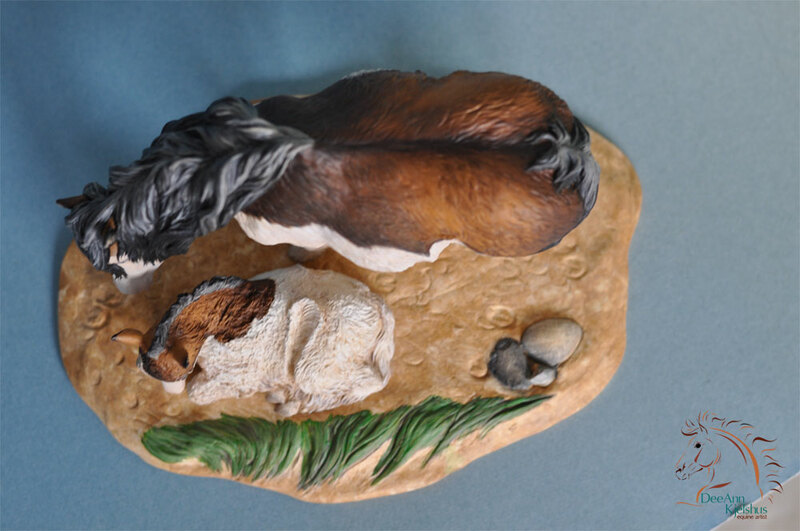 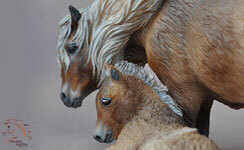 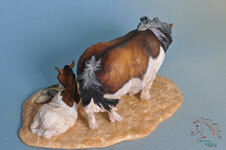 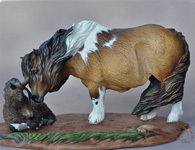 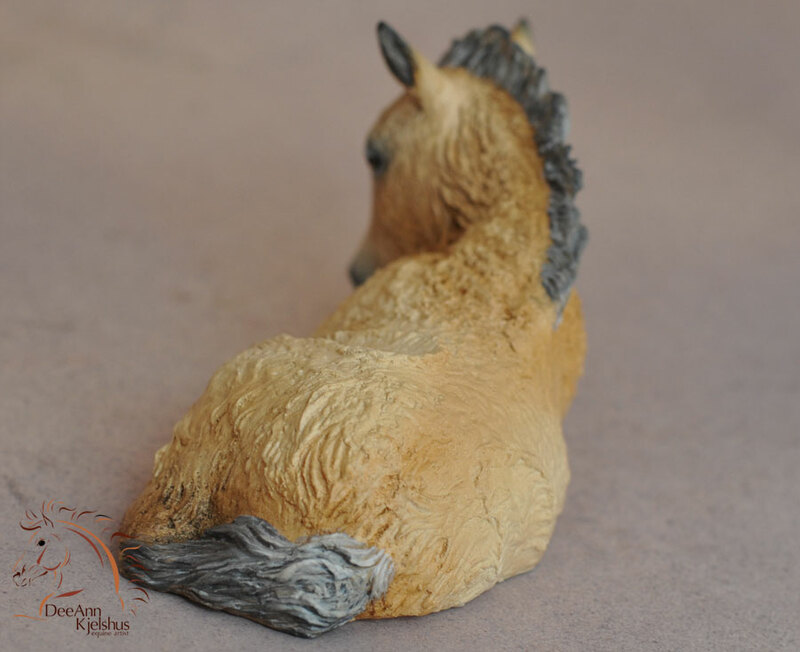 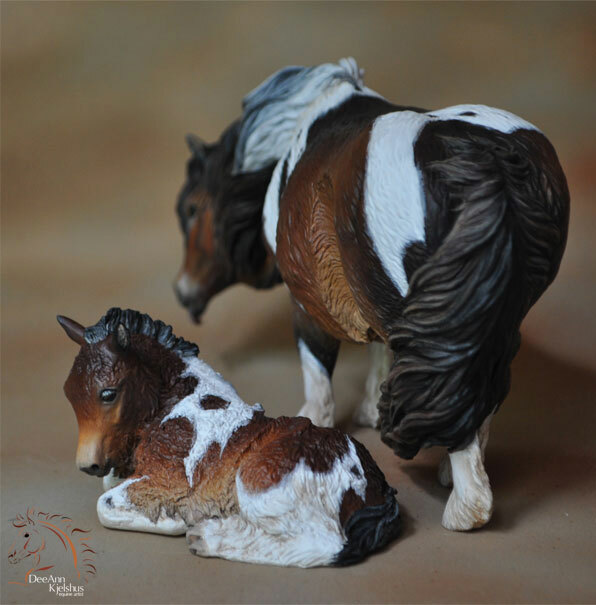 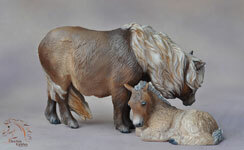 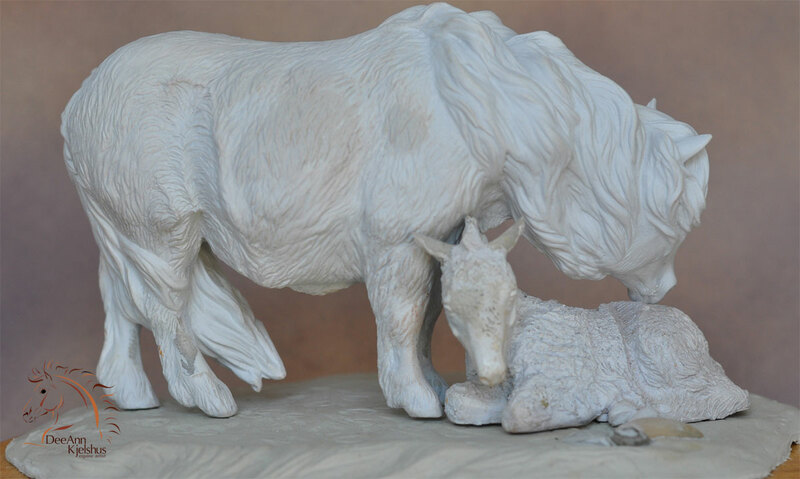 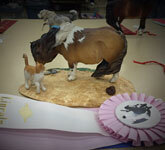 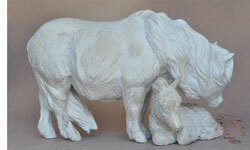 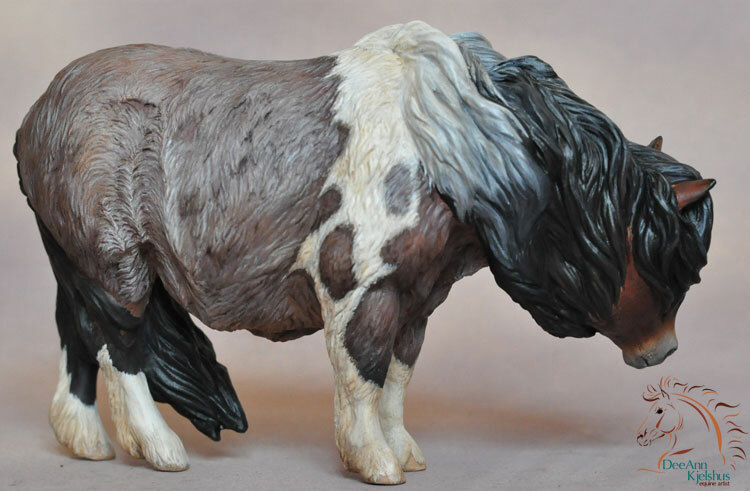 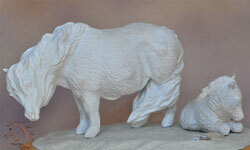 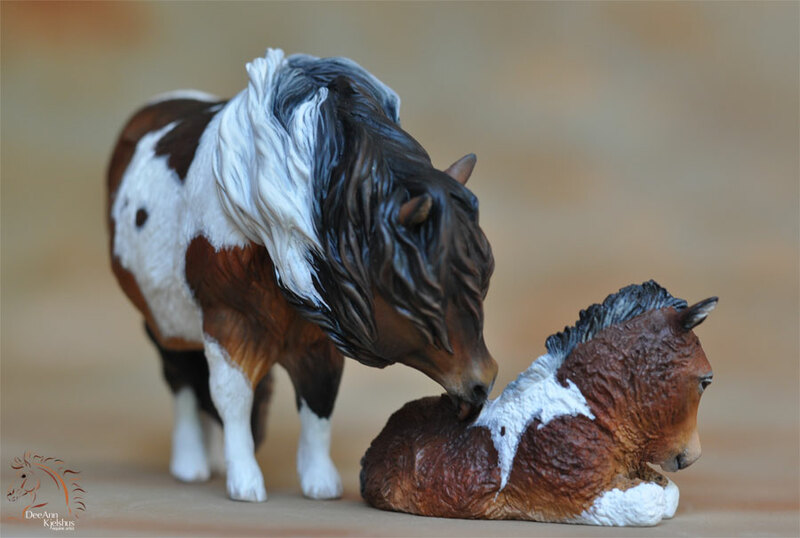 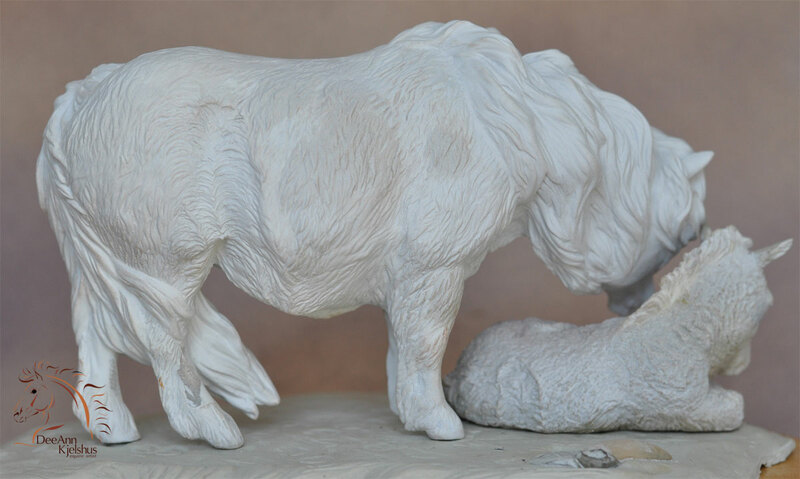 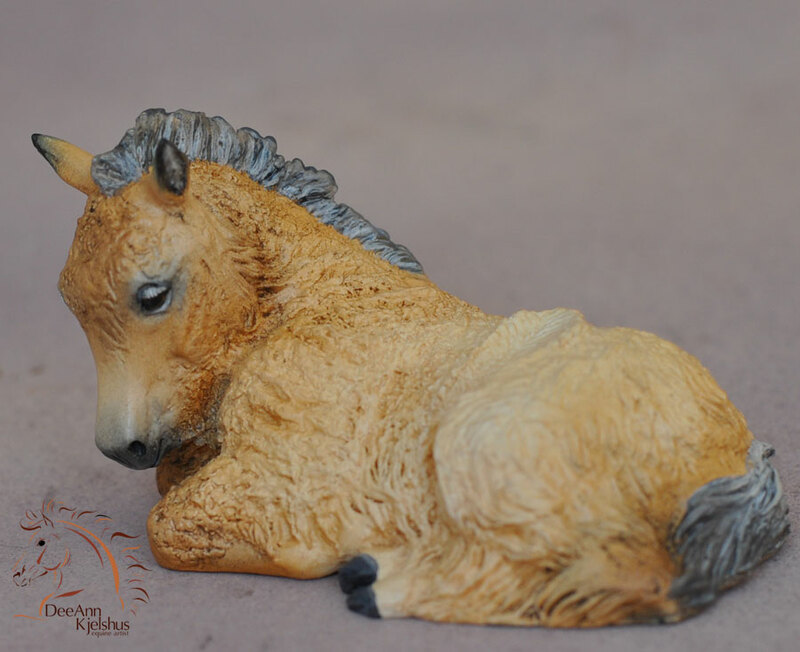 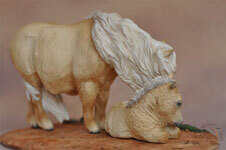 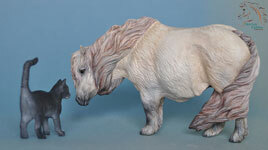 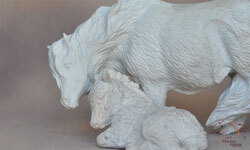 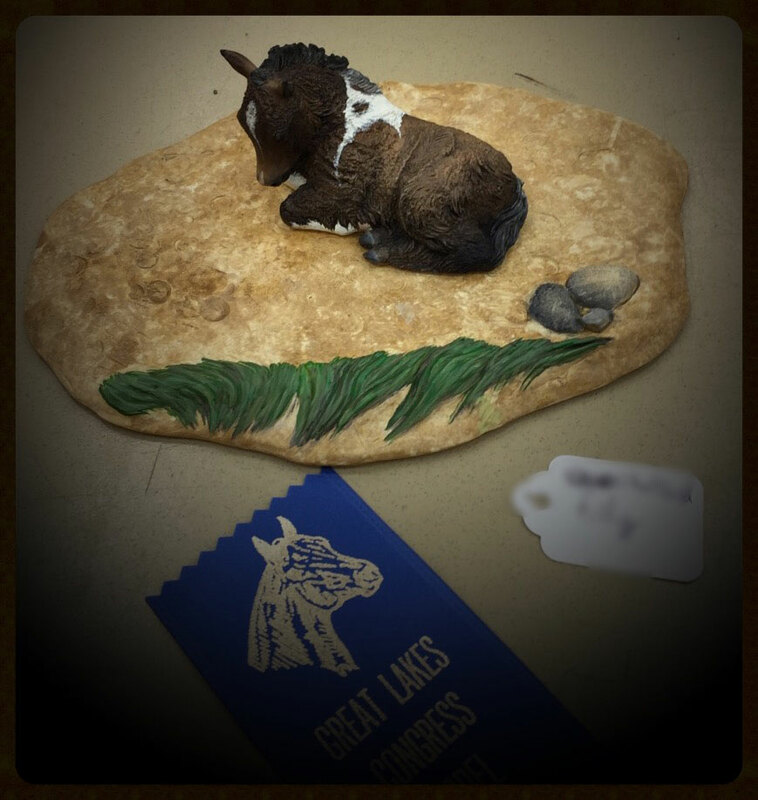 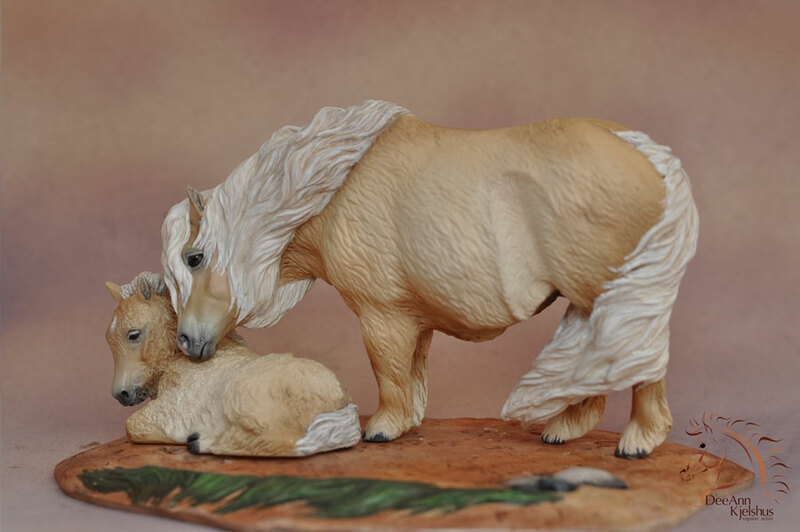 Introducting a Shetland Pony Mare and Foal sculpted by DeeAnn Kjelshus. 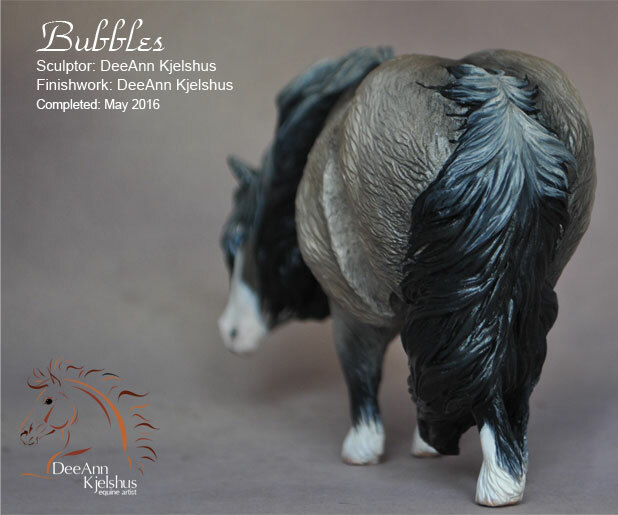 Completed in April of 2015. These two are full of cute fuzziness! 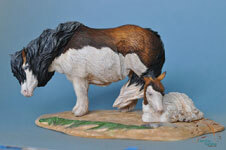 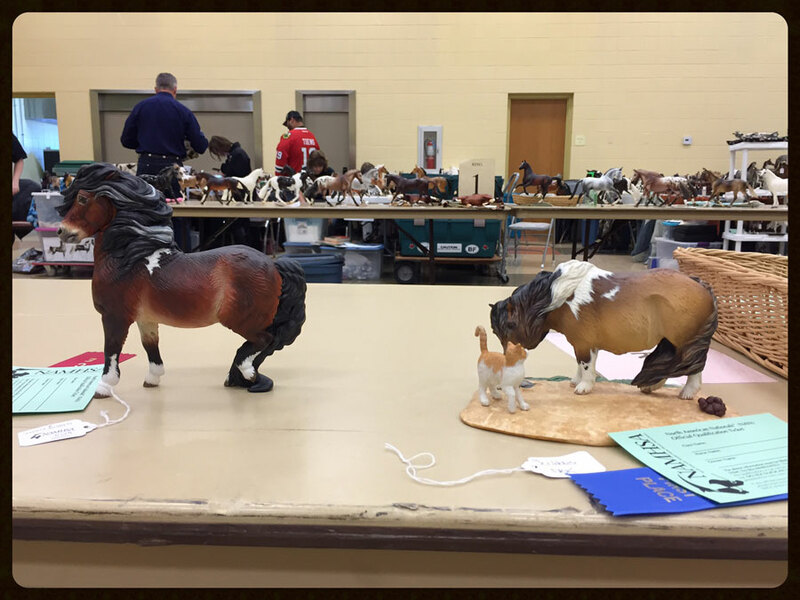 Made to represent a Shetland Pony Mare and Foal in the cool spring before coats begin to shed out. 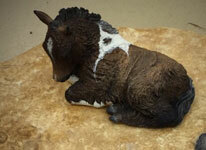 About 9 years ago I sculpted a lying shetland foal called “Keepsake”. 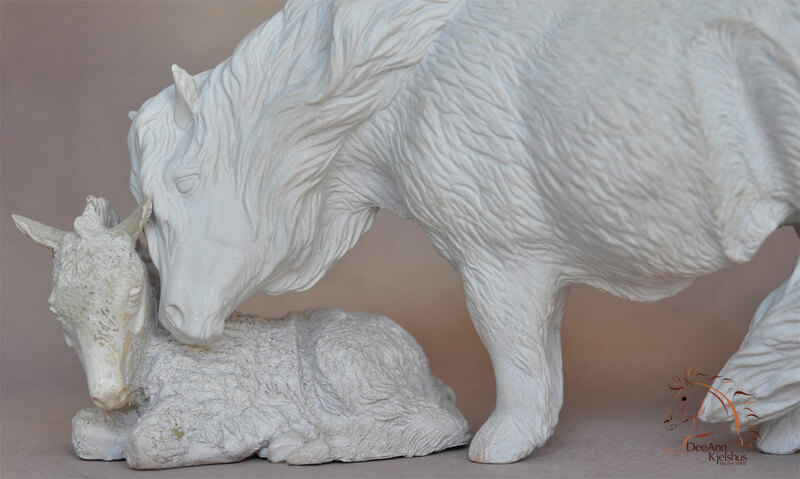 He was cast in fine artists resin as a limited edition that sold out quickly. People were begging for a mare for Keepsake. 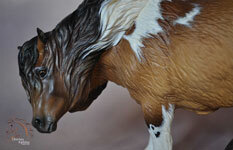 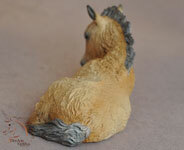 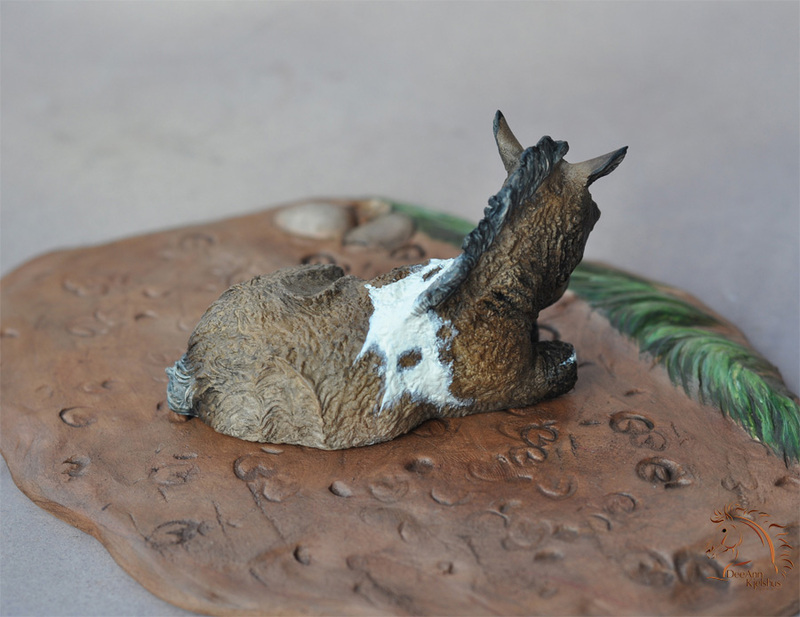 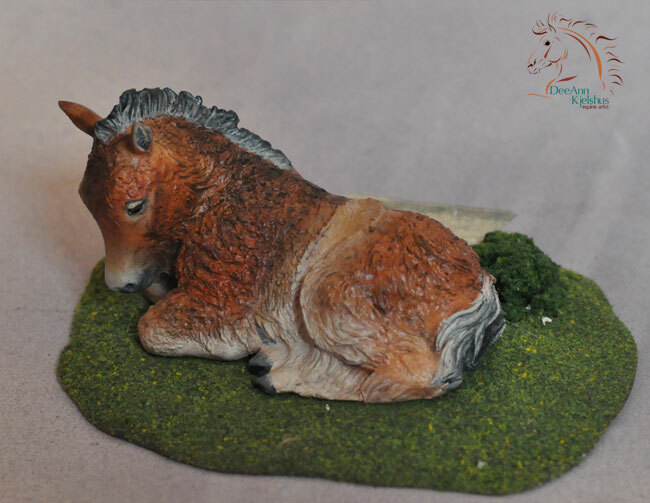 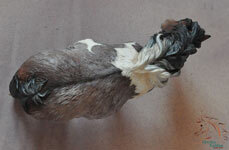 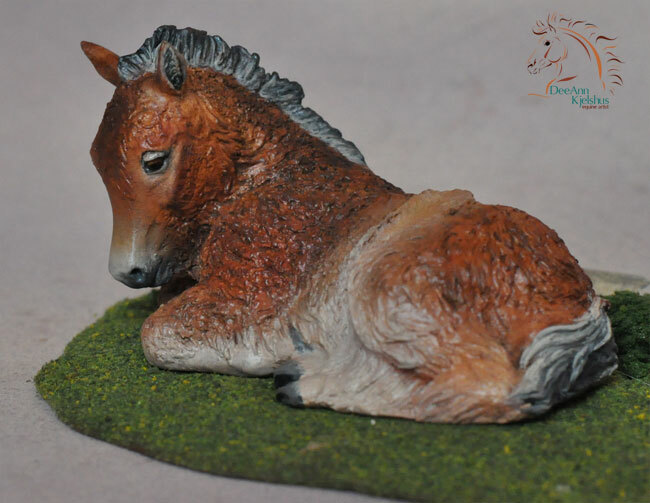 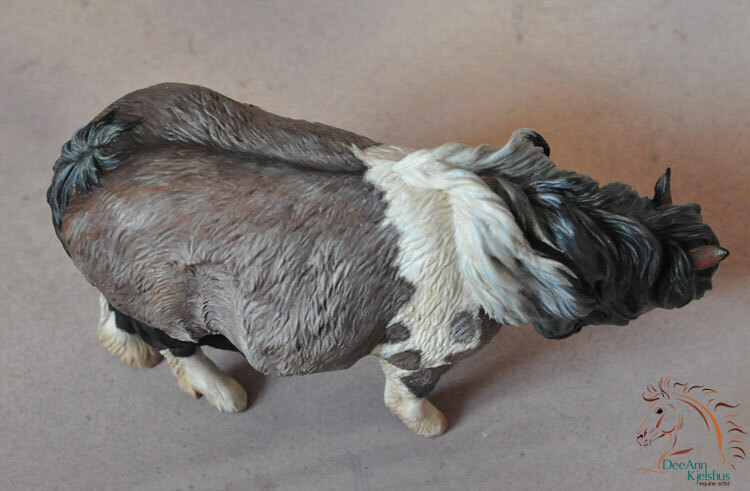 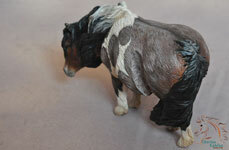 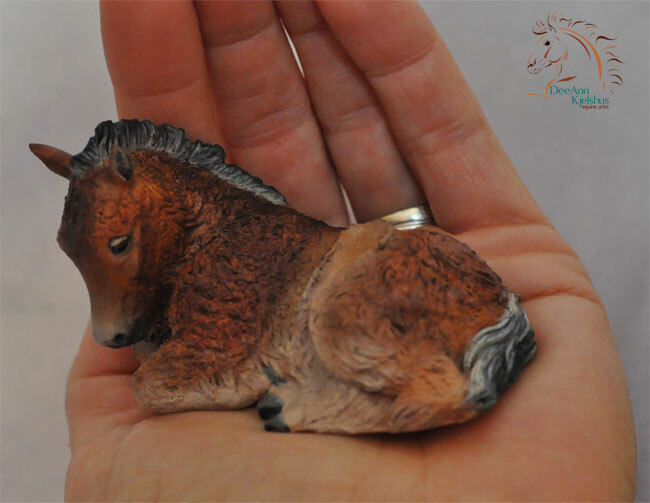 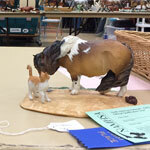 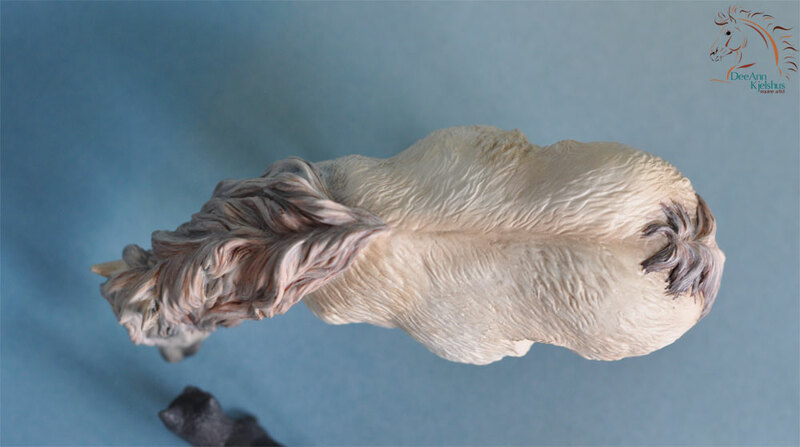 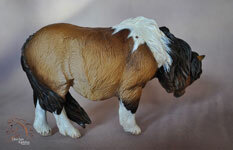 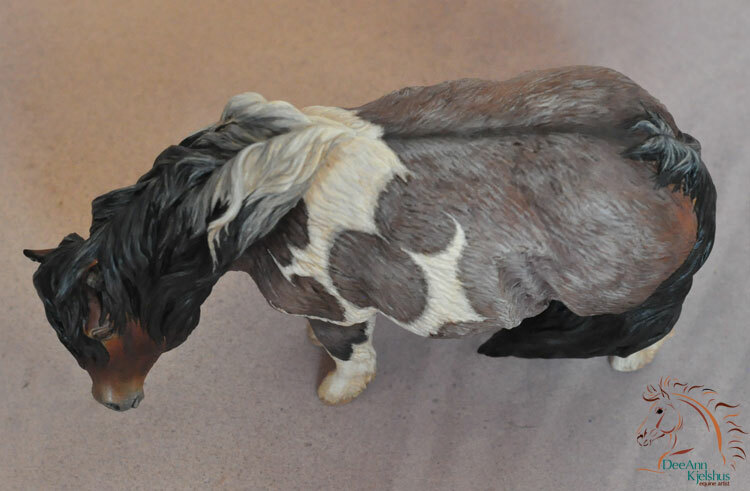 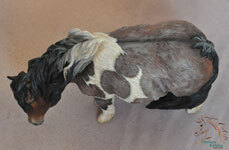 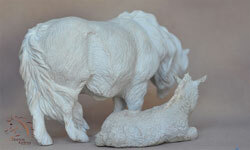 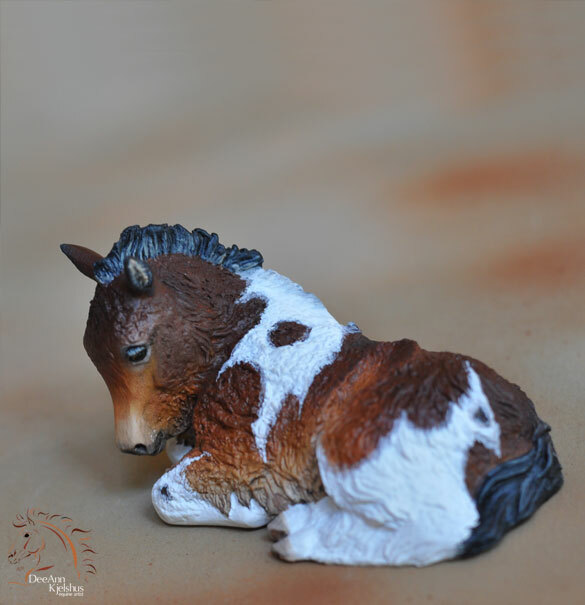 Finally, in January 2013 I started sculpting a fuzzy little shetland mare. Since Keepsake was in his summer coat I chose to customize him a bit, add a bit of fuzziness and change his face. 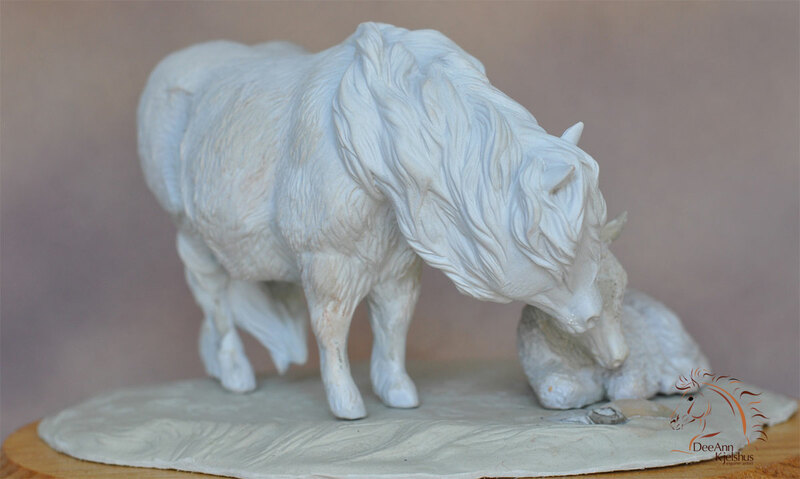 My current job is a full time Mother to my two young girls so the completion of these two sculpts took me a little over two years. 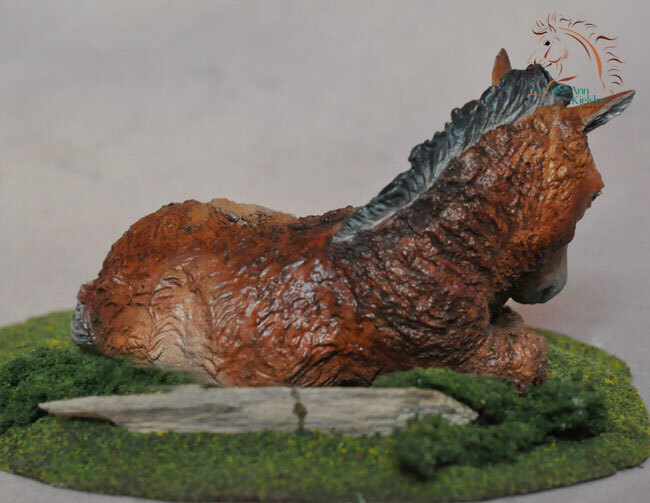 But I feel like the effort and time were well worth it, and hope you do as well. 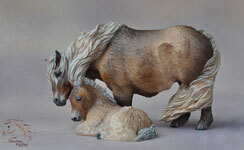 This pony pair comes complete with a base they can both relax on together. Currently being offered in Fine Artists Resin. 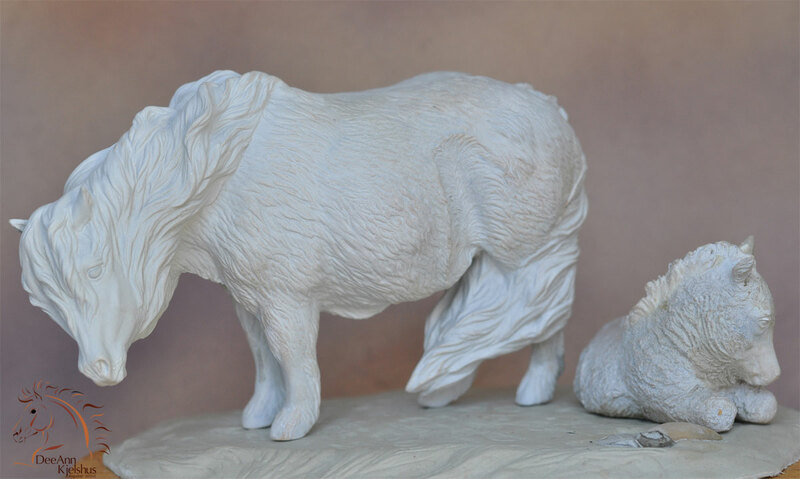 Professionally cast. 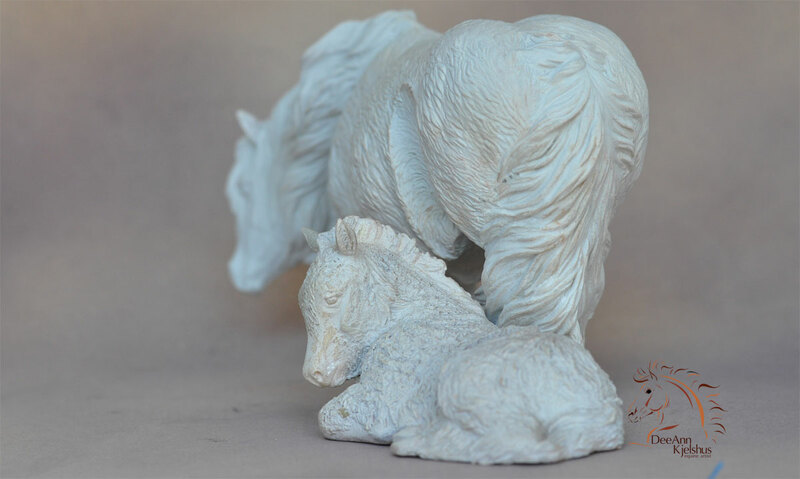 The resin editions will be at least a one mold run each (usually a minimum of 50 pieces). 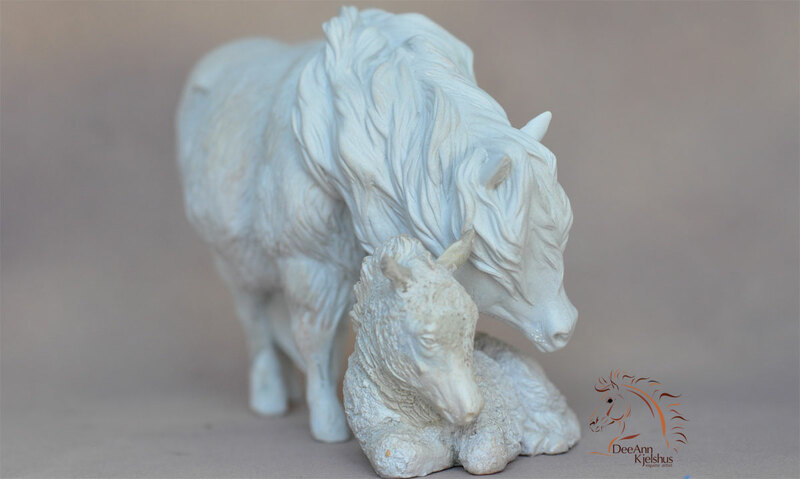 If there is enough interest, further molds can be made. 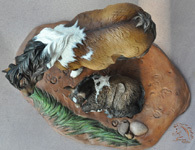 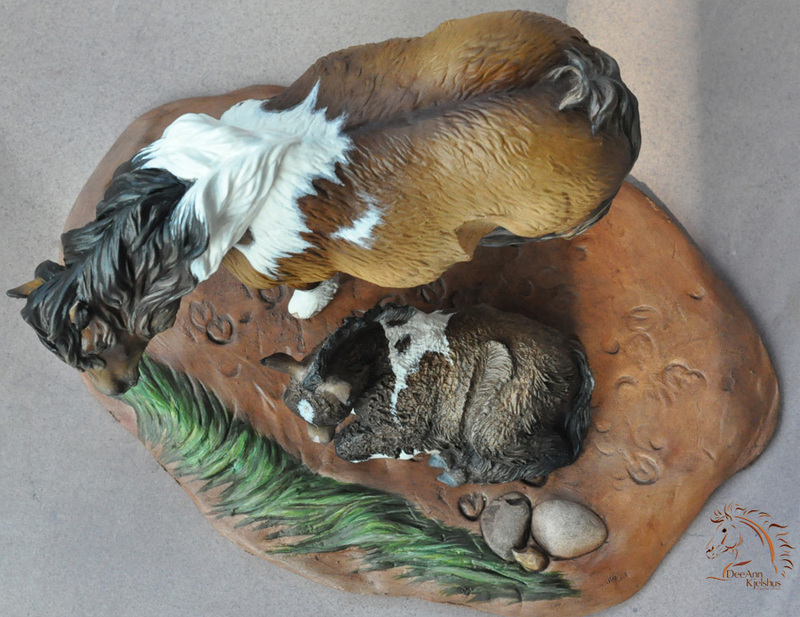 The set comes with both the mare and foal as well as a base to display the set together. 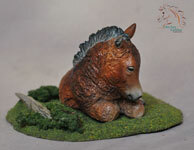 You may purchase them as a set, which includes a FREE resin base made for this set to display them on. Or you may purchase them individually. 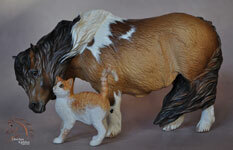 Please specify in your order. 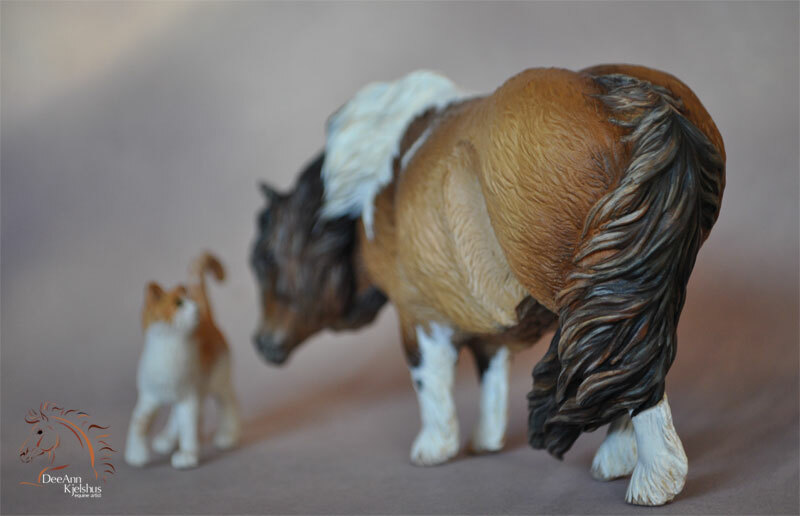 The only way to get a FREE base will be by ordering the set together. 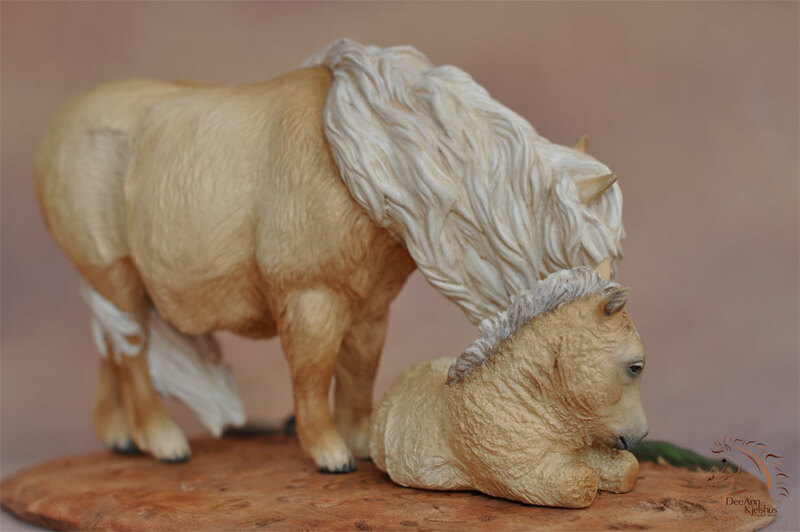 After I have received your order, you will be contacted. 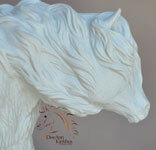 If I can accept your order, your deposit(s) will be due in 5 days. 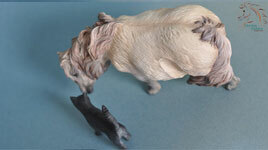 I accept PayPal (including credit cards through PayPal), Money Orders, and checks with approval. Castings ship in the order they are paid off in full. 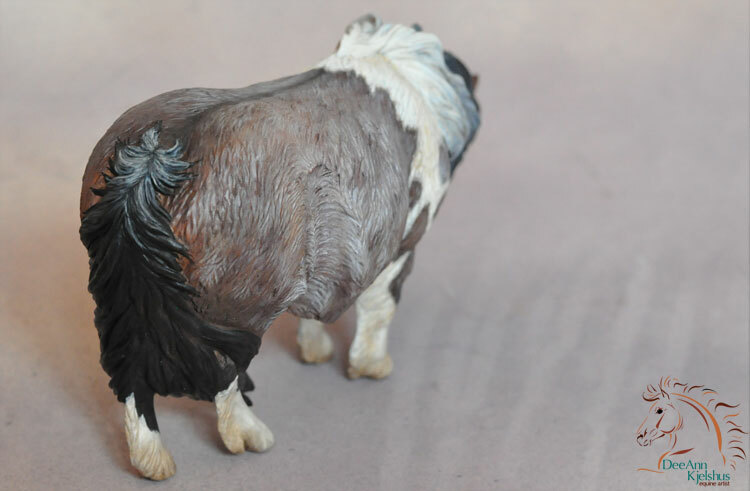 Please read below before placing your order! 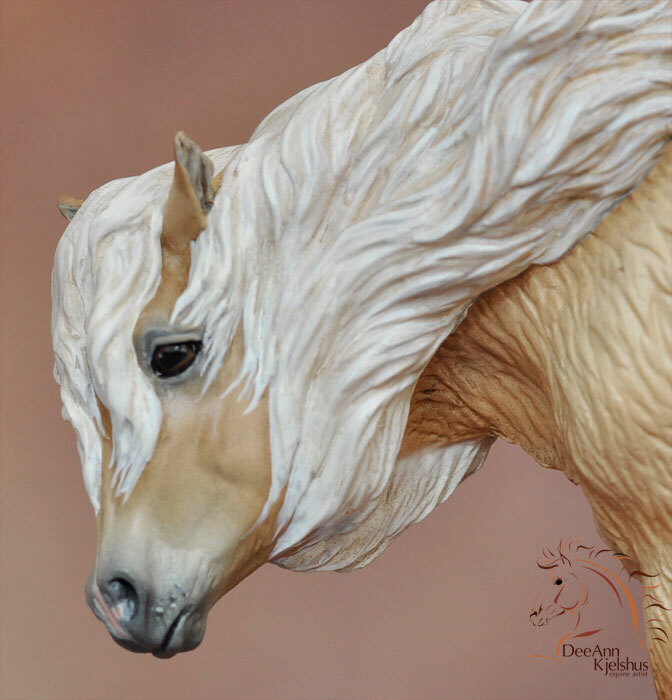 Send an email to deeann (at) artbydeeann (dot) com with the following information. 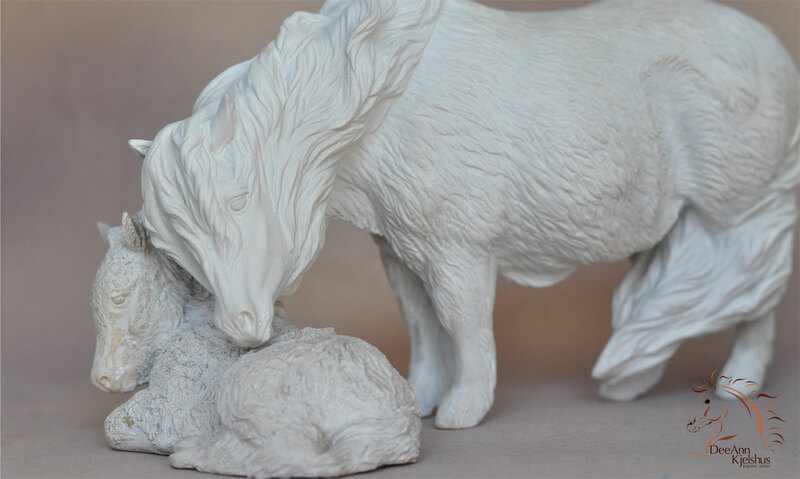 Do NOT send payment until your order is confirmed! You will pay your balance off in a timely manner we work out in terms, and a time payment contract. 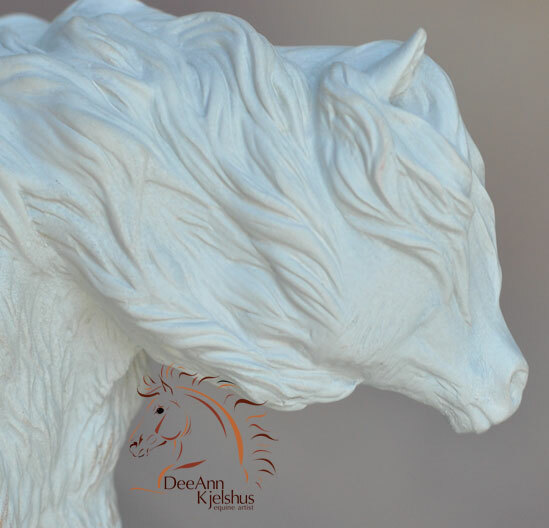 If you need to cancel your resin order, your initial deposit(s) will not be refunded. Customers who fail to respond to notification about their orders, will have their orders cancelled 30 days following notification. 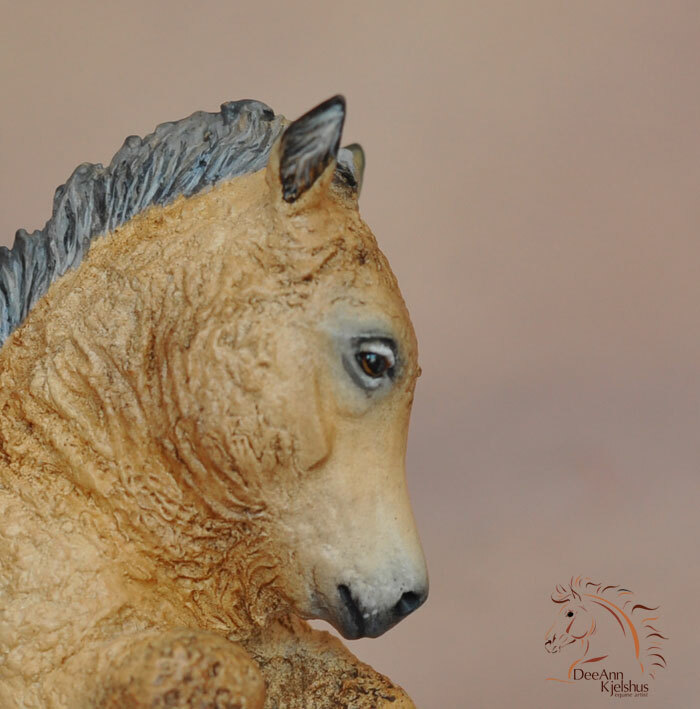 If for some reason I am not able to fill an order in which a deposit/deposits has/have been received, a full refund will be offered.